Well, this didn't take long. 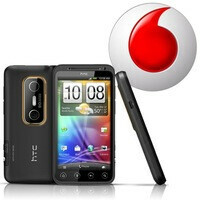 The GSM version of the HTC EVO 3D may have been announced only yesterday, but Vodafone UK is already teasing us with a listing of the smartphone on its web page. Teasing seems to be the most suitable term for it as the EVO 3D is only listed in the “coming soon” section with no word regarding its price or availability, at least for now. However, if the rumor that we heard not long ago turns out to be true, it wouldn't be long before the smartphone hits Vodafone's shelves. Currently, Vodafone UK appears to be the only European carrier to have the EVO 3D in its portfolio, but other carriers are very likely to follow suit. First of all, during its announcement yesterday it was confirmed that the 3D-enabled smartphone will be made broadly available across Europe over the next month. Besides that, it looks like the EVO 3D is getting quite a lot of attention by consumers in the US so it would not be surprising to see it becoming pretty popular among European smartphone users as well. Those of you who live in the UK and are interested in the HTC EVO 3D can check out Vodafone's web page and sign up to receive an email notification when the smartphone becomes available. In the meantime, feel free to check out this promotional video that the carrier has made, you know, just to tease you even more.